The clock is ticking. The impeachment plan against President Goodluck Jonathan will be tabled on the floor of the Senate on December 16, a senator who is part of the grand plat has revealed. 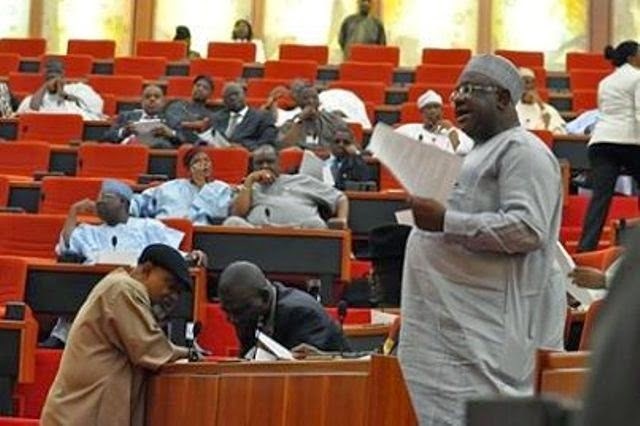 Senator Alkali Jajere (Yobe South) spoke after the Senate adjourned plenary till December 16 to enable the lawmakers attend the primaries of their political parties. The senators backing the plan have listed 14 “impeachable offences” against the President. Senator Jajere, one of the senators to have endorsed the impeachment notice, is number four on the list of 63 senators supporting the plan. He said: “I have signed the impeachment notice because there are impeachable offences against President Jonathan. You are my colleagues and being a journalist who practised journalism for 27 years, I know these things are not new. “ In 2011, this Senate approved N240billion as subsidy fund but the same government spent N1.7trn, which is a clear breach of the constitution, clear breach of the Appropriation Act. “The business of government is to curtail excesses but this government has shown that it is incurably deficient in handling the situations in this country. “That government cannot say it wants to continue. The President should have even resigned without waiting for him to be impeached. “The duty of the legislature is to act as a check and balance because it is the most important symbol of democracy. “If you don’t have the legislature, you don’t have democracy because every other arm of government exists even when there is no democracy. It is only the legislature that makes a democracy, a government. “As at last week, 63 of us had signed up for the impeachment. My signature was the fourth but I can confirm to you that we have 63 signatures but after the session today (yesterday), two people called me and told me that they want to sign. “One of them is an APC senator who was away campaigning because he is contesting the governorship election. The other is a PDP senator. “The impeachment issue is not just coming now. It is also a process that started early in the year but there was a hiccup but today, there are issues that have triggered the National Assembly to do what it should do. “No matter what the time, it is a three-legged issue. The National Assembly will now have to initiate the process and then, submit that process to the judiciary. “The judiciary will form a committee through the Chief Justice of Nigeria (CJN); the National Assembly will carry out the verification of the committee and conclude the remaining process. “The National Assembly will soon conclude our own side and submit the notice to the judiciary. “As of today, the required signatures to initiate the impeachment notice had been obtained. ”Senate has adjourned to the 16th. By that date, the impeachment notice will be presented on the floor of the senate. “Before the end of today, I can assure you that the list will swell up to 70. “It is on the impeachment day that we need two-third of the members to carry out the exercise, but we need only one-third, which we already have, to initiate the process. “It is just a matter of one day sitting. We will just push it before the two chambers."